We pretended to be Texas tumbleweeds and tumbled and tumbled to "Tumblin' Tumbleweeds" by Moe Brown. If you search the archive, you'll find the following videos that correspond with songs we've been singing these past few weeks. We'll have videos of this year's classes up next week! Sing along with Hickety Tickety! Bon Jour, Dobre Dyen, and Guten Tag! We sang a song that said "hello" in 9 different languages, played instruments from around the world to musical selections from 10 different countries around the world. With all this talk of groundhogs and shadows, we decided to have a little fun dancing with ours. The music is "Orpheus of the Underworld", by Offenbach. We celebrated "space week" by going on a space walk, and searching for aliens with our "light sabers" to the theme from "Star Wars". You can make your own light saber by covering the end of a flashlight with a tube of colored tissue paper. I wrapped ours in a sheet of plastic (from a page protector) to give it a little stability too. (It's pretty tough to fight aliens with a floppy light saber). Getting around the "black videos"
If you can't view this week's videos, try going to an older post - a video from December or before and then come back to this page - it has worked for me? In the meantime, I'll try to re-post and see if that helps. Blogger is experiencing some problems and as a result, all the videos are black. Hopefully they'll have this fixed asap. Be sure to check back for the latest videos! This is a favorite winter activity. First we got ready for "winter" play by putting on our coats, hats, gloves, boots, etc. Then we skated, made snow angels, rolled in the snow and pretended to throw snowballs at one another. Freeze and melt along with us as we play "Freeze and Melt!" We are all like snowflakes! This week we talked about how God makes each snowflake different from every other snowflake, just as he makes each one of us different from one another. We looked at pictures of real snowflakes (Snowflakes by Kenneth George Libbrecht). We cut out snowflakes and danced to "We Are All Like a Snowflake" by Greg and Steve. One of our favorite ways to start our day is by singing "Hello" songs. This is one of our favorites. Usually we sing each child's name in place of the words "preschool friend". We say "hello" in many different languages: source: www.wikihow.com/Say-Hello-in-Different-Languages. Certainly I am slaughtering the pronunciation, so bear with us. Feel free to let us know if you have other languages you'd like to share! For more snowman singing fun try "Once There Were Some Snowmen", or "In the Sun They Melted" by InsideOut A capella. They sing versions of this preschool favorite in a variety of musical genres. The kids LOVE dancing along, and you'll enjoy all the musical memories from U2 to the Beach Boys and Kermit the Frog. We'll be doing all sorts of drumming activities in music this month. 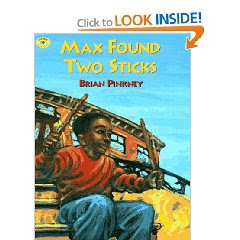 This week we read Max Found Two Sticks, by Brian Pinkney (Aladdin, 1997). In the story, Max explores different kinds of instruments for tapping. We talked about all the different things Max drummed on, and what they sounded like. As you read the book, be sure to watch for how Max responds to each person's question, and the only word Max actually utters. 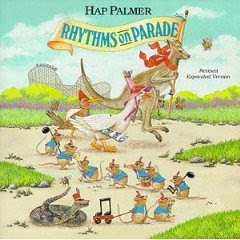 Then we pulled out our "claves" (music sticks) and tapped along to Hap Palmer's "Tap Your Sticks" from his album Rhythms on Parade (you can download this on itunes, or off amazon). ("Woodpecker" is another fun Hap Palmer drumming song). Then, we spread out several different kinds of things like boxes, milk jugs, pans, tinfoil, etc. around the room and took turns tapping along to music on each "instrument", just like Max. You can pick up your own sticks (like Max), or use pencils, spoons, chopsticks, dowels, etc. and tap around the house. See how many different kinds of sounds you can find! Watch for more drumming activities each week this month!